The Multi-Country Payroll Outsourcing (MCPO) market —one of the fastest growing markets in the human resources (HR) outsourcing space— is set to continue riding a multi-year growth wave of 20 percent, according to Everest Group. This momentum is fueled by the rising appreciation enterprises have for the MCPO value proposition as well as increasing provider maturity. 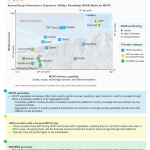 Although MCPO service providers have performed well with respect to the traditional drivers (cost reduction, process standardization and compliance), buyers expect more in terms of next-generation technologies and strategic support. 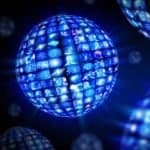 In fact, drivers for MCPO adoption are slowly shifting from the traditional to next-generation ones, which include factors such as better employee experience, better insights through analytics, and access to next-generation digital solutions such as artificial intelligence (AI) and robotic process automation (RPA). The leading players in the MCPO landscape—namely ADP, NGA Human Resources, and TMF Group—have done just that; they have constantly innovated and invested in developing technological capabilities to differentiate themselves from others in the market. One growing area of technology investment is employee experience solutions, where next-generation technologies are being used to enhance both employee empowerment and employee engagement. For example, greater empowerment can be achieved through advanced employee self-service portals, omnichannel experiences, and investments that enable rapid response and accuracy. Employee engagement can be enhanced through HR systems that are easy to use, provide a consistent experience across sub-processes, have an intuitive look and feel, and offer employees a personalized experience, including multi-lingual support. 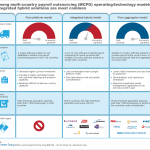 Everest Group explores these findings and others in a recently published report: “Multi-Country Payroll Outsourcing (MCPO) – Annual Report 2019 – Persistent Growth Amidst Evolving Propositions.” This research provides a comprehensive analysis of the global MCPO market across various dimensions such as market overview and key market trends, buyer adoption and solution trends, and service provider landscape. Buyers headquartered in North America and Europe, the two most mature markets, are the leading adopters of MCPO globally. Rising adoption is seen from the emerging markets of Asia Pacific and Latin America. The market has witnessed strong adoption by small-sized multinational corporations (MNCs), which are spread across two to five countries. The large market segment also has witnessed a resurgence of activity, with many large enterprises venturing into large multi-continent deals. The small market segment witnessed a dip in the average deal size, while the mid- to large-sized segments witnessed a significant increase due to a rise in large multi-country deals. ADP, NGA Human Resources and TMF Group dominate the MCPO market in terms of market revenue. The three companies cumulatively constitute over 50 percent of the total market revenue.